Instrument / signal processor Module. Black panel. Signal processor to extract envelope, trigger and gate from almost any source. 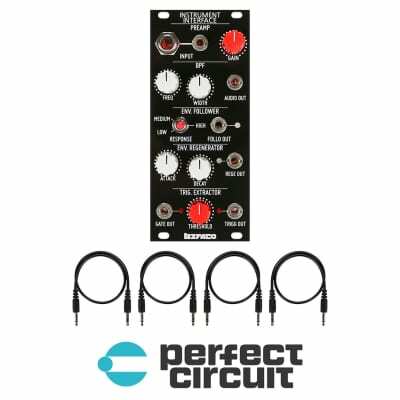 Features a band pass filter to select frequencies that will feed the envelope/gate/trigger extractors. Suitable to process musical sources,extracting information from a selected frequencies bandwidth. Preamp allows to get either line inputs or CV levels. Then filtering stage will select the bandwidth that will feed envelope and Gate/Trigger sections. Outputs featured: filtered out, envelope follower, envelope re-generator and and Gate and trigger extractor . Bandpass filter with bandwidth and frequency controls. Envelope follower (with response selector) and envelope re-generator ( with attack and decay controls) outputs. Gate and trigger extractor (With threshold selector) threshold.